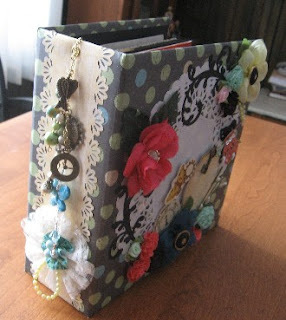 In my tutorial, I show you how to create my 8x8 Interactive Scrapbook Mini Album. The album covers measure 9x9 inches and the inside pages measure 8x8 inches. It's very interactive with flaps, pull-outs and pockets and there is lots of room for photos. The thick 3" spine means you have tons of space for embellishments too! You can interchange some of the interactive elements on the pages to vary your album designs and use any paper you want to customize your album. The tutorial is in PDF format and contains approximately 50 pages of EXTREMELY DETAILED step-by-step instructions from start to finish and 200 PHOTOS I took as I was creating the album: making the interactive pages, making the covers and spine, binding the pages into the album, making the closure and ideas for embellishing the cover and spine with your own supplies. Measurements are included for every page, flap, pocket, tag, etc. you will need to construct this exact album. You can refer to the videos anytime as I plan to leave them online for as long as the service provider can host them. Below are 2 videos that show the album I completed in the tutorial, and the album I completed in the videos. I am also including photos of the various pages in the tutorial album as well as more videos of some of the other albums I created based on this tutorial. By purchasing this tutorial, you can make as many of my 11x11 albums as you wish for personal use. You can also make and sell the albums you make. If selling albums online, please credit me by including a link to my website: “Tutorial for making this album is available from www.scrappinrabbit.com”.